ThreadGroup(String name) - Constructs a new thread group. ThreadGroup(ThreadGroup parent, String name) - Creates a new thread group. int activeCount() - Returns an estimate of the number of active threads in this thread group and its subgroups. int activeGroupCount() - Returns an estimate of the number of active groups in this thread group and its subgroups. void checkAccess() - Determines if the currently running thread has permission to modify this thread group. void destroy() - Destroys this thread group and all of its subgroups. int enumerate(Thread list) - Copies into the specified array every active thread in this thread group and its subgroups. int enumerate(Thread list, boolean recurse) - Copies into the specified array every active thread in this thread group. int enumerate(ThreadGroup list) - Copies into the specified array references to every active subgroup in this thread group and its subgroups. int enumerate(ThreadGroup list, boolean recurse) - Copies into the specified array references to every active subgroup in this thread group. int getMaxPriority() - Returns the maximum priority of this thread group. String getName() - Returns the name of this thread group. ThreadGroup getParent() - Returns the parent of this thread group. void interrupt() - Interrupts all threads in this thread group. 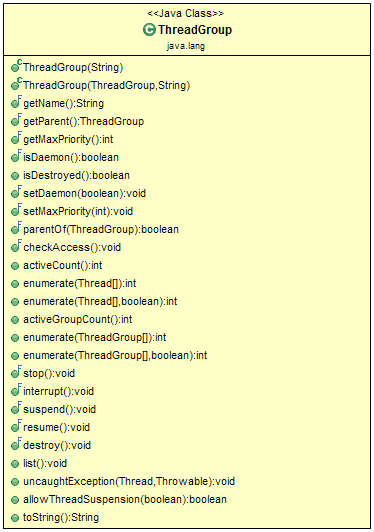 boolean isDaemon() - Tests if this thread group is a daemon thread group. boolean isDestroyed() - Tests if this thread group has been destroyed. void list() - Prints information about this thread group to the standard output. boolean parentOf(ThreadGroup g) - Tests if this thread group is either the thread group argument or one of its ancestor thread groups. void setDaemon(boolean daemon) - Changes the daemon status of this thread group. void setMaxPriority(int pri) - Sets the maximum priority of the group. 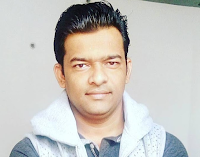 String toString() - Returns a string representation of this Thread group. void uncaughtException(Thread t, Throwable e) - Called by the Java Virtual Machine when a thread in this thread group stops because of an uncaught exception, and the thread does not have a specific Thread. UncaughtExceptionHandler installed. Let's create a few threads and make it as a group.